Elegance, relaxation, and aquatic activities are what Ormond Beach is all about. This sophisticated small-down destination is right beside the bustling Daytona Beach, allowing vacationers to live it up or tone it down at their leisure. 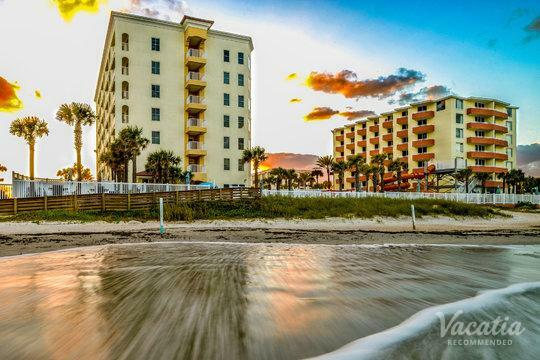 One of the first things you'll need to do when planning your Ormond Beach vacation is to search online for Ormond Beach resorts, condo rentals, and other vacation lodging. Here at Vacatia, your search will come to an end. Our Ormond Beach resorts all come highly recommended. Take a look through our listings of Ormond Beach condo rentals and other lodgings to find your perfect accommodation. We are happy to answer all your questions so that you can book your vacation rental knowing exactly what to expect before you arrive. When searching for accommodation in Ormond Beach, it can be difficult to choose between a more relaxed, homey vacation rental and a high-end resort with housekeeping and on-site dining. At Vacatia, you can have the best of both worlds. Our resort residences offer a unique kind of lodging in which you'll have your own kitchen, living room, and washer/dryer, in addition to on-site staff and other resort luxuries. You can cook your own meals for a cozy night in, or you can take off for a night on the town while staff handles the cleanup. It has never been easier to choose the perfect vacation rental in Ormond Beach. With Vacatia, you can have the comforts of home and the bonus of hotel services. Ormond Beach is a little further up the Floridian Atlantic Coast than Daytona Beach, and it provides a premier resort and vacation experience in a charming small-town atmosphere. Among its earliest visitors was John D. Rockefeller himself, and the area still exudes elegance and relaxation. These days, it is easier than ever to access the bustling nearby locales of Daytona Beach (practically next door) and Orlando (just over an hour's drive). On the west side of Ormond Beach, you can find the Tomoka River. On the east border is the majestic, clear water of the Atlantic Ocean. Ormond Beach also contains a number of springs, lakes, and rivers - in short, it is a paradise for water activities. Vacationers can also take in the array of recreational and cultural activities offered year-round. The historic Main Street in downtown Ormond Beach also offers all manner of diversions. Book one of Vacatia's Ormond Beach vacation rentals today.